Haida Gwaii’s monitoring program for invasive marine species got a big boost this year. When even your closest followers call you ‘rock vomit,’ it’s a good sign you’re unwanted. Also known as the “carpet sea squirt,” Didemnum vexillum is a spineless, sea floor-smothering animal — an invasive tunicate that can overgrow scallops, mussels, and other creatures. Native to Japan, D. vex has spread around the world, blanketing fishing grounds in places like Cape Cod. 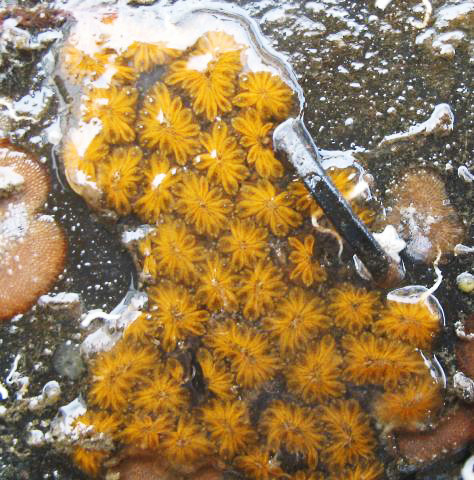 In 2010, it was the first invasive tunicate found in Sitka, Alaska. Biologists are now watching closely to see if D. vex spreads to Haida Gwaii, and also trying to learn more about two other invasive tunicates and other ‘fouling organisms’ that are already here. Starting with a handful of sites in 2014, Haida Gwaii’s monitoring program for invasive marine species got a big boost this year, expanding to 90 test plates at nine sites across the islands. “We’re really well covered,” says Stu Crawford, a biologist with the Council of the Haida Nation, noting that the program is a joint effort by the CHN, Gwaii Haanas, and Fisheries and Oceans Canada (DFO). “Because of this three-way collaboration, we’ve probably got half the sites in B.C.,” he said. In October, the Haida Gwaii program was joined by two experts from the U.S. Smithsonian Institute, which pioneered the test-plate method. “It’s pretty high-tech science,” joked Linda McCann, a Smithsonian biologist who spoke at both Haida Gwaii high schools and an ‘Aliens Among Us’ talk in Masset. Each test plates is a square of plastic weighed down by a brick, she said. Researchers sink them one metre underwater, wait three months, then haul them up to see what’s growing on. Some plates get encrusted by a single species — near Vancouver, many are completely covered in mussels. One plate recovered from Masset Inlet last month had both of the invasive tunicate species that have covered Haida Gwaii docks and rocks in recent years. Of the 30 alien marine species in local waters, the two tunicates are a major concern. One is the violet or chain tunicate (Botrylloides violaceus). Growing in purple, pink, yellow, white or orange colonies, it has buds that form long rows or chains. 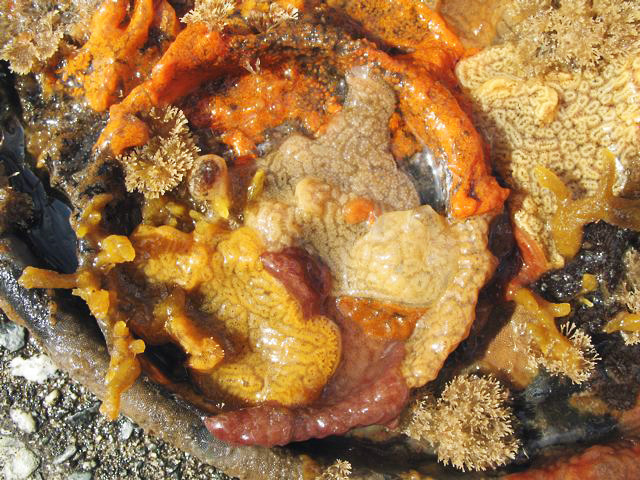 The other is the golden star tunicate (Botryllus schlosseri), another colony-forming species that is usually two-tone black and brown, or orange and green. Its buds form a starburst pattern. McCann said the trouble with invasive tunicates is that they can blanket large areas of seafloor, and are highly adaptable. “They live basically everywhere you can imagine in the oceans, from the deep sea to the nearshore coastal waters, in marsh habitats and intertidal areas, or kelp forests,” she said. Structures such boat and barge hulls, docks, buoys, and pier pilings are also welcome habitat to tunicates, she said, and once established, they can even spread on eelgrass and algae. To better identify invasive tunicates and other fouling organisms, McCann said researchers are building a huge database of DNA sequences. “Basically, we’re bar-coding everything,” she said. Vanessa Hodes, an aquatic researcher with DFO, said compared with visual identification, which is painstaking, DNA analysis is like a magic button. But it’s also a costly one. Worldwide, the cost of managing all invasive species is somewhere on the order of $1.4 trillion. One of the costliest is the zebra mussel, which spread to the Great Lakes in the ballast of a single ship. Another is the European green crab, which was introduced to the East Coast over 100 years ago and began spreading up the West Coast in the last two decades. Hodes said green crab are already well established near Sooke, Quatsino, and Ucluelet on Vancouver Island, where they eat or compete with juvenile Dungeness crab, but fail to outcompete the tougher Red Rock crabs. So far, green crab have not been seen on Haida Gwaii, nor in the Strait of Georgia where much of B.C.’s aquaculture is. But they spread quickly across the west coast of Vancouver Island during the warm El Nino of 2001. Once they round the corner, Hodes said green grab will most likely establish themselves in the Strait, with unknown consequences. McCann and Hodes said people can do to stop the spread of invasive tunicates and other marine species, starting with learning what they look like. Boat owners can clean their vessels before moving them. The easiest way to get tunicates and other creatures out of all the nooks and crannies is to let the boat dry on land for a few weeks. New regulations allow DFO officers to stop boats and ships from launching if they are harbouring fouling organisms. Aquarium owners can help by not dumping their unwanted creatures into the sea, but giving them away to friends or otherwise disposing of them on land. Anyone who sees an odd marine creature along the Haida Gwaii coast can help by calling local biologists such as Stu Crawford (250-626-3302). DFO also has an aquatic invasive species line at 1-888-356-7525. On a larger scale, McCann said researchers are testing ways to treat ships’ ballast water. In Sitka, divers are now testing chlorine, cement dust, and heavy concentrations of salt on enclosures full of invasive D. vex. McCann encouraged anyone who sees what they think is a marine invasive species to photograph it if they can, and take notes on where it was found. Correction — This article has been corrected to reflect the fact that green crab eat or compete with juvenile Dungeness crab rather than ‘kill’ them. Also, while it’s likely green crab may become more established in the Strait of Georgia once they round Vancouver Island, the consequences of that change are still unknown. The original article implied a much more dramatic invasion than is expected.